Pricing subject to change without notice. Additional travel expenses may apply. 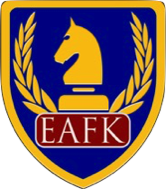 EAFK is licensed by The Knights of The Guild to our clients annually. Costs are determined by campus and grade level, not by the number of students enrolled. Components are integrated, and one may not be employed independent of the others. Pricing varies by location, and is subject to change without notice. There are no refunds for knighting ceremonies canceled by schools after their scheduled dates have been confirmed. Multi-campus discounts for EAFK programs are available under certain conditions. Email amber.parr@me.com for more information. Description: Held on campus, faculty training provides administrators and faculty members with a complete overview of EAFK, including familiarization with program integration guidelines; roles/responsibilities for school, sponsor, and EAFK developer; curriculum access and instruction procedures; EAFK event planning; how to prepare for knighting ceremonies; selecting student awardees; award medal ordering; how to create the EAFK environment on campus and working with Rotarian advisors to organization the EAFK service club. Time Required: 90 minutes with administrators and faculty. Frequency: Mandatory for first-year EAFK schools at the beginning of each year, and every 1-2 years thereafter, as needed for program updates or refreshing. Training is provided at your location by EAFK staff. Cost: $150 per training event, per school. Rotarian (sponsor) training is included in this price. Time and Frequency: all versions last 45 minutes, and are held annually at the beginning of each year. Tournament reservations are limited and should be made as far as possible in advance. Group discounts are available for multi-school performances of the Tournament. Covered/Indoor arena venues recommended. Reservations are final. Inquire about weather risks. Description: Curriculum use is licensed annually, and must be taught daily in class to all students. Each campus receives a unique password to access the curriculum website at the beginning of each year, which should be shared with classroom teachers. Time and Frequency: Ten minute lessons, taught daily in class. Schools may choose which traits are taught. Annual Licensing Fee: First year - $1,800 per campus; Subsequent years - $750 per per campus. Description: Knighting ceremonies are campus reward assemblies that recognize student accomplishment of EAFK objectives. The ranks of Page (grades K-1), Squire (grades 2-3), Knight (grade 4), and Knight of Black Prince Order (grade 5) are earned at the teacher's discretion, along with corresponding medallions. Parents of awardees are invited to knighting ceremonies by the Principal. Time and Frequency: 90 minutes. Commencing in October, elementary campuses are to conduct at least six knighting ceremonies each year and Middle schools are to conduct at least four. Cost: $500 to $800 per ceremony per school, depending on location. Award medallions cost $2.85 per medallion + shipping. Plan to order medallions for 1/3 of students annually. Description: The EAFK Student Service Club is the tactile component of our program. Directed by Rotarian sponsors on campus, the student service club facilitates two school-wide service projects per year. Time and Frequency: 30 minute meeting on campus, typically during lunch, twice per month. Cost: Rotary sponsors spend an average of $500 in setup costs in the first year for Rotary banners, Rotary bell, gavel, printing, etc. Description: The parent education seminar is an evening, on-campus presentation for parents and families of EAFK students who are interested in learning more about EAFK, and how to reinforce the EAFK program at home. Simple, effective parenting skills and relationship-building tips are also provided. 45 minutes, one event. Description: The Anti-Bullying Program includes independent, interactive sessions with three student groups: alleged bullies, alleged victims, and the entire student body. Led by EAFK knights, this program effectively addresses the causes and responses to bullying behavior and is endorsed by several police departments. 45 minutes per group, once or as needed.